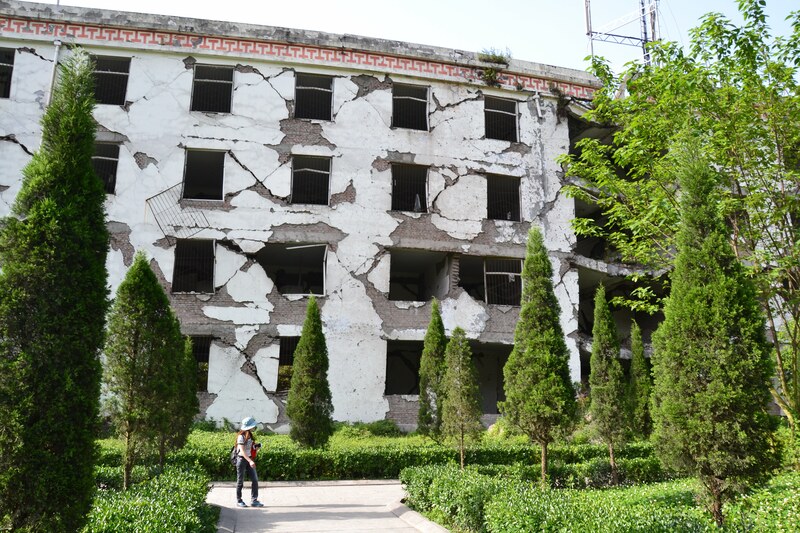 In my last post I blogged about the International Symposium on Mega Earthquake Induced Geo-disasters and Long Term Effects in Chengdu, China, and now I want to report about one of the field trips that I participated after the symposium. 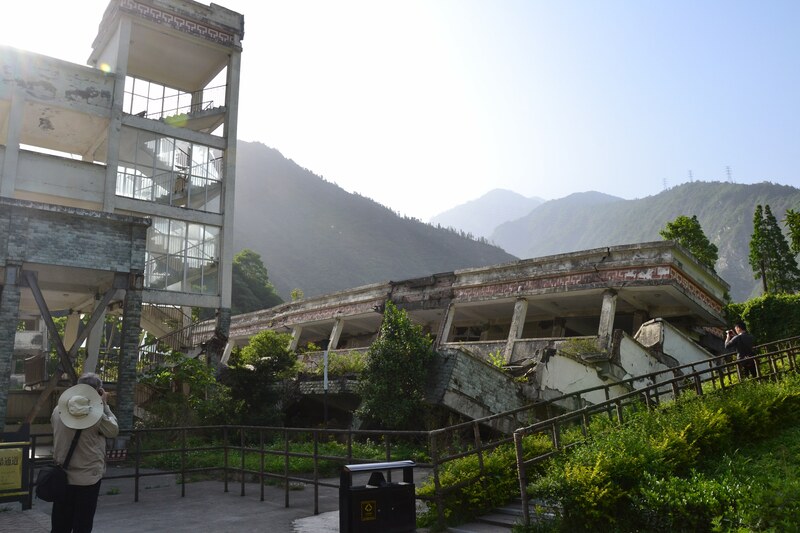 While we spent the morning and early afternoon at the Qipan gully to look at a giant debris flow that occurred five years after the earthquake, in the afternoon we had the chance to visit the memorial site of the 2008 Mw 7.9 Wenchuan earthquake, which is basically the collapsed building of a middle school close to the epicenter that was left as it was after the earthquake. I want to report about this site first because it is more about the earthquake itself. In my next post I will report about the Qipan gully debris flow. 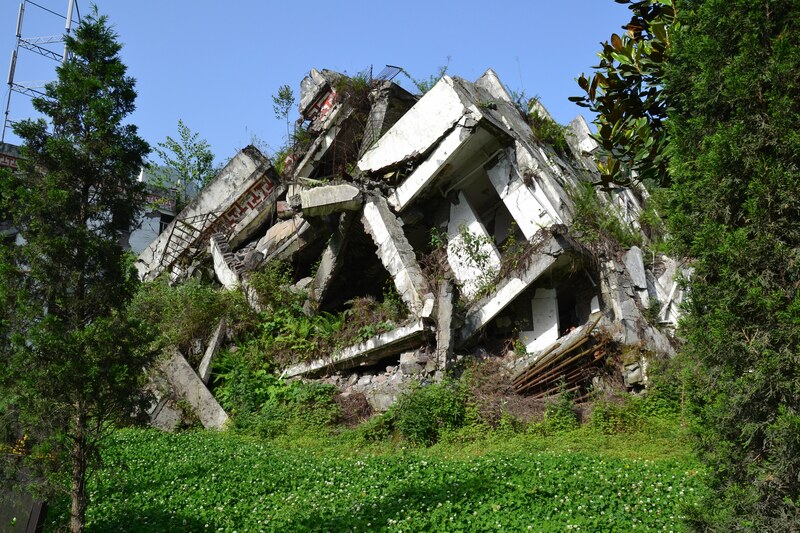 Panorama view of the Wenchuan earthquake memorial site. 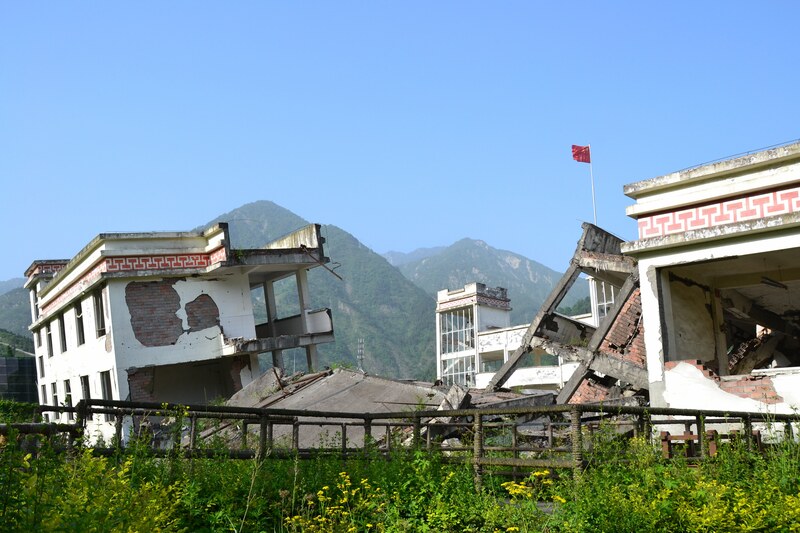 The earthquake occurred on May 5, 2008, at 2:28 AM local time and it originated at the 240 km long Yingxiu-Beichuan fault, which lies within the Longmen Shan fault zone, a SW-NE trending fault zone along the eastern rim of the Tibetan Plateau. While a thrusting fault mechanism with horizontal and vertical movement predominated in the southwestern part of the fault, it is almost vertical in the northwestern part with a predominating strike-slip mechanism. Damage, fatalities and also the initiation of landslides were concentrated in the southwestern part (Shen et al., 2009; Huan & Fan, 2013). Moreover it is believed that some junctions between segments of the fault were locked before the earthquake, resulting in high energy release when they broke during the earthquake. At these junctions the slip rates were highest and apparently also the concentration and magnitude of earthquake induced landslides. After having visited the heavily damaged town of L’Aquila during the PATA-Days in April I went to the Wenchuan site with quite mixed feelings. 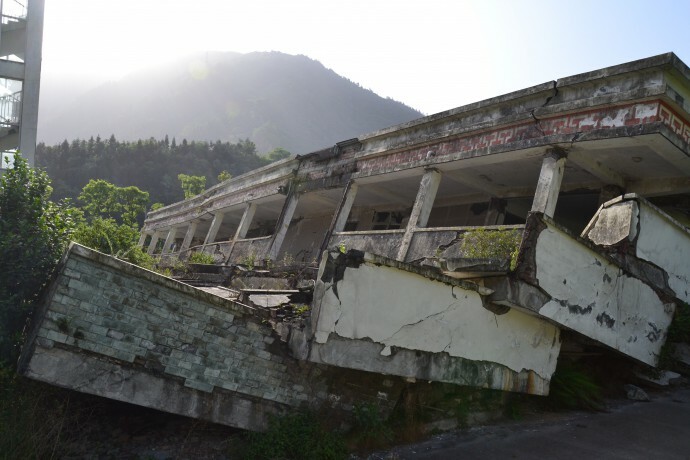 In the school, which is now the memorial site, 43 students, 8 teachers and 4 workers were killed during the earthquake. 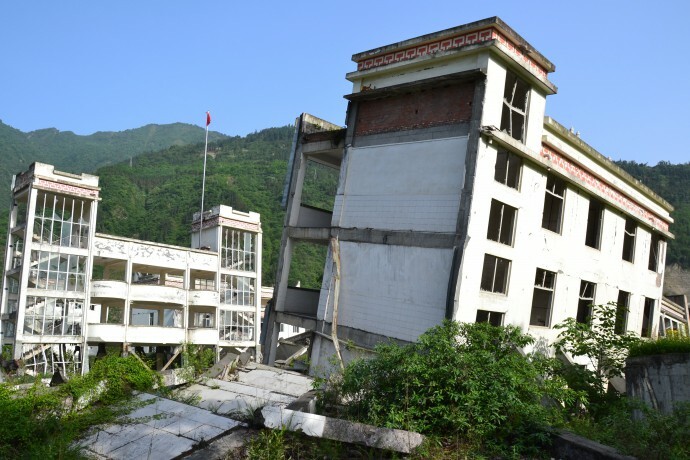 The school is located in the town of Yingxiu, only a few hundred meters from the earthquake epicenter and it was built two years before the earthquake. At the front of the school a commemorative plaque was installed and a guided walk takes the visitors around the school buildings. While the new built town of Yingxiu is like any Chinese town full of noise and bustle, at the site itself it was very quiet. Everything was left as it was after the earthquake and a broad palette of earthquake damage can be observed here, as I will show you now on some photos. The commemorative plaque at the front of the school building. The walk around the school building started on the right of the main building. You can see the following crumbled building on the very right of the panorama shot, hidden behind the trees. The house was just completely crushed. I think this was a dormitory. 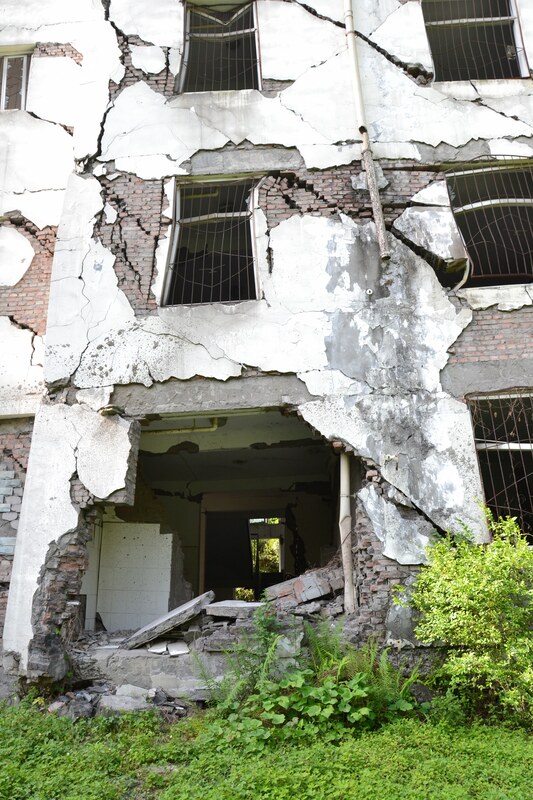 Also on the right of the main building there was a building, which seemed to be another dormitory of the students. It did not fail, but you can see those diagonal cracks all over the facade and on the right there are sagged floors. Also the metal grids in front of the windows have partially fallen out and on the following picture, which was taken around the left corner of this building, there are some amazingly bent metal grids. Around the left corner of the dormitory, bent metal grids. We left the dormitory behind us and walked around the main school building on a board walk. The building on the right of the photo, which is shown as a close-up in the following photo, collapsed in an interesting manner. Right of the main building. On the following photo we arrived left of the main school building. Here one building was just tilted as a whole without complex damages. What I find interesting are the bent window frames. And that both adjacent buildings apparently collapsed completely. Left of the main building. Here the building from the other side, the adjacent building seemed to have failed completely and on the right side a building was tilted in another direction. This is also where the boardwalk ended, leading back to the square in front of the school. Left of the main building, almost arriving back at the start. The visit at this site was an intense experience and I am now definitely healed from my secret wish to be once in a tiny little earthquake. 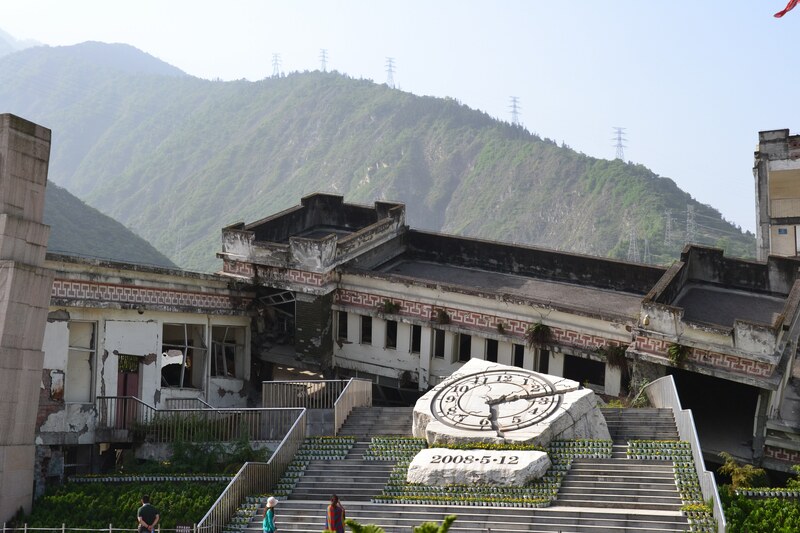 As horrible as it is, I think it was a good idea to conserve the destructed school for future generations as a memorial. 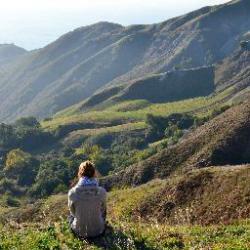 If any of you gets the chance to travel to western China you should really visit Yingxiu! And by the way, the landscape is just beautiful. Worth the risk? Huang, R., Fan, X., 2013. The landslide story. Nature Geoscience, 6, 325-326. Shen, Z.-K., Sun, J., Zhang, P., Wan, Y., Wang, M, Burgmann, R., Zeng, Y., Gan, W., Liao, H., Wang, Q., 2009. Slip maxima at fault junctions and rupturing of barriers during the 2008 Wenchuan earthquake. Nature Geoscience, 2, 718-724.